Gay bar that registers as the one of the city's oldest, first opened in 1964, with different management since the late 1980s. 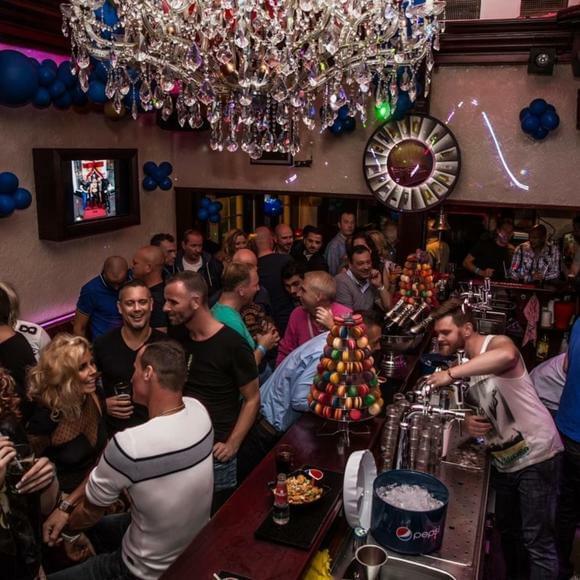 The corner bar is located opposite the river Amstel, in the road Amstel and in Amsterdam's first gay ghetto, also referred to as Amstel. Characteristic of the area's establishments, there's one long bar with stools. Also features chandeliers and maroon padded seating at periphery. Renovated in 2007. Sunday's are-a-drag (as in cabaret) with Drag Fever, and DJs and go-go boys features at weekends. Check website for themed nights. €10 to spin the wheel and you might win shots or drinks or lose it all! Everyone was great here! Great staff and owners. Music videos were fun! Strongly recommend!